Described as an update of the "classic string shelf", this customisable shelving system by Berlin design firm Studio Hausen comprises a series of steel and ash wood modules. 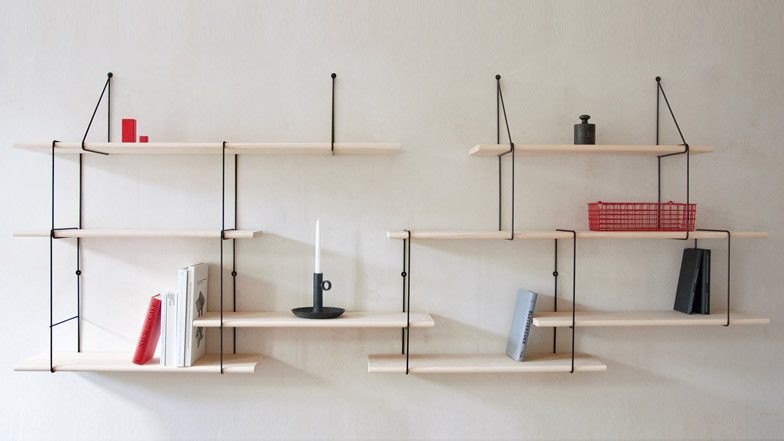 The Link Shelf by Studio Hausen consists of boards made from ash, with thin black steel mounting brackets. The four shelves in each set are the same width and depth, but come in two different lengths. Three different styles of bracket – one triangular, one square and one rectangular – create a variety of assembly possibilities. Some of the brackets can be attached to a wall, while others create a suspension system between the shelves. "A number of shelf boards made of massive ash wood, a set of mounting brackets made ​​of black steel and an amazing simple design principle form an innovative and visually stunning product," said the studio. "According to the experimental design approach of the Studio Hausen, the customer can arrange the elements of the shelf adapted to their needs and space requirements." Produced in Germany, the system can be reconfigured over time and additional parts can be purchased to extend it. The product is available exclusively through online store Monoqi. "It's about time the classic string shelf got an update — and this time, it comes with its very own spirit," said Monoqi, referencing the modular shelving design created in 1949 by Swedish architect and designer Nils Strinning. "Its steel and ash-wood construction forms an engaging interplay with many potential compositions: asymmetrical, high-reaching, or laid out lengthwise, the link-shelf is designed to work perfectly for your individual environment," added Monoqi. Studio Hausen was founded by Jörg Höltje following his graduation from Berlin's University of the Arts in 2009. The studio has previously produced work for brands including Ligne Roset, De La Espada, and Camper.